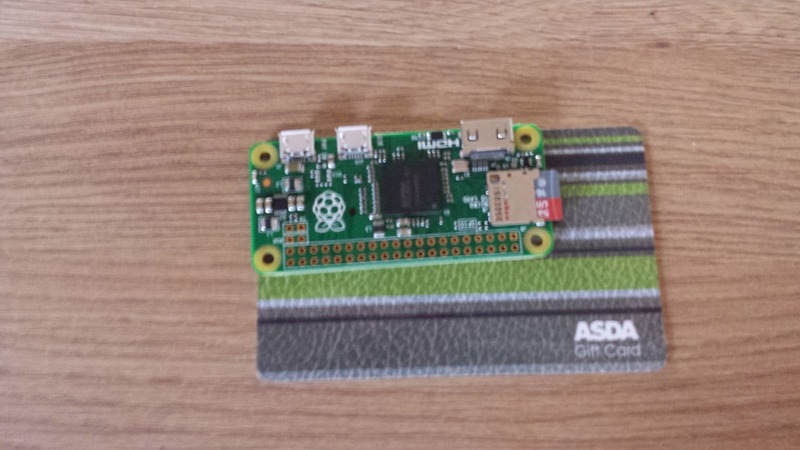 The above image shows you just how small the Raspberry PI Zero is. As you can see it is around about half the size of a credit card or in this case an Asda giftcard. The Raspberry PI Zero was launched with much fanfare and was even given away for free on the cover of the MagPI magazine. Whilst the Raspberry PI Zero isn’t going to win any awards for power or performance it works well with the Raspbian operating system. Setting up the Raspberry PI Zero has various challenges that you need to overcome to be able to use it and that is why this guide has been written. 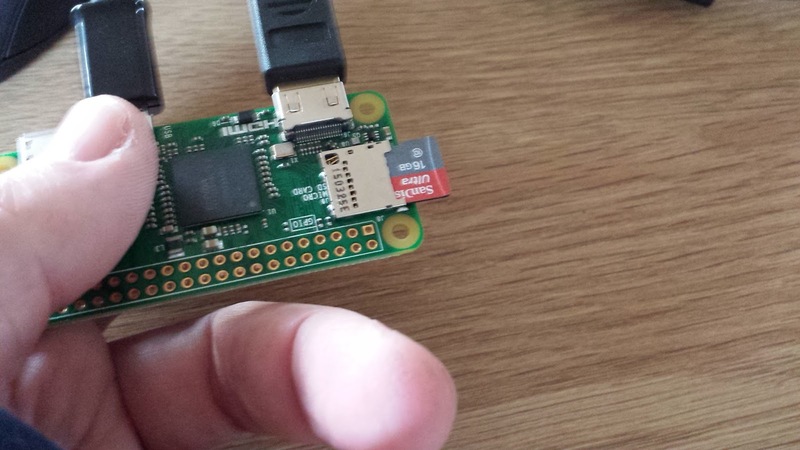 With this guide you will find out how to set up the SD card, how to connect all the components and how to boot the Raspberry PI Zero and connect to the internet. Whilst the Raspberry PI Zero is available for less than £10 there are various components you will need in order to use it and the above image shows most of what you will need. I have listed the items you will need below along with links where you can buy them from. You can of course buy the items from many other locations and the links are provided just to make it easier for you. In the top left corner is a Raspberry PI power supply. You can buy one of these for £6.30. Most mobile phone power supplies will also work with the Raspberry PI Zero. Below the power supply is a standard USB computer keyboard and below that a standard USB mouse. Next to the mouse is a micro SD card. You can buy one of these with an adapter for £4.99 on Amazon. If your computer doesn’t have an SD card reader then you will need to buy one of these as well. Adjacent to the Micro SD card is the Raspberry PI Zero itself which you can buy from the PI Swag store. The most important item is next to the Raspberry PI Zero in the image above. It converts the micro USB slot into a standard USB slot. 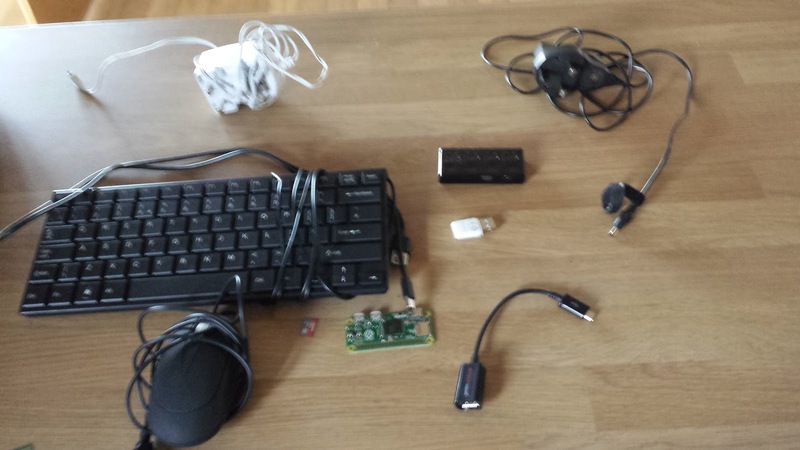 This makes it possible to connect the Raspberry PI to a standard USB hub which you will use to connect the keyboard, mouse and wireless USB dongle. 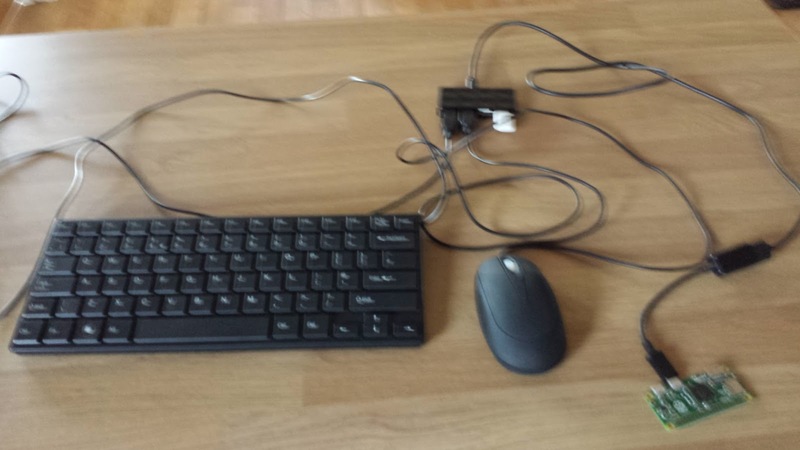 The little white thing next to the keyboard is a wireless USB dongle and this makes it possible for you to connect the Raspberry PI Zero to the internet. Above the wireless dongle is a USB powered hub which provides more ports for connecting the keyboard and the mouse. Next the the USB hub is the power supply which should ship with the hub. 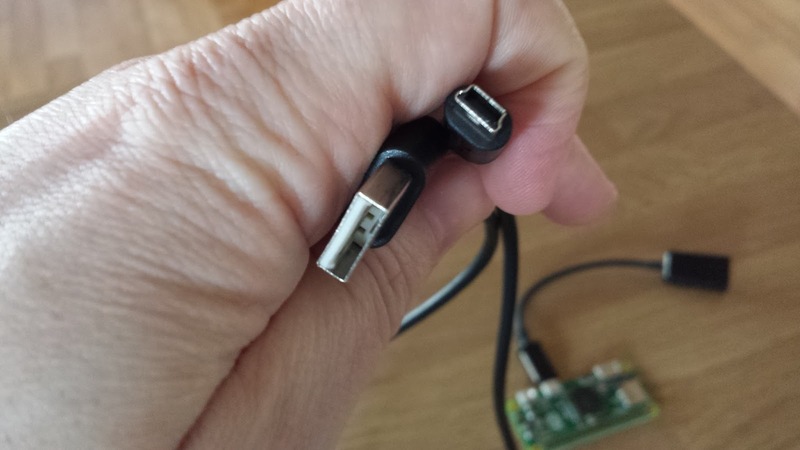 The final thing that you will need which is shown in the above image is a micro HDMI to HDMI cable for connecting the Raspberry PI zero to a monitor or TV. Before setting up the Raspberry PI Zero itself you need to download and install the Raspbian operating system to the Micro SD card. You can download Raspbian from https://www.raspberrypi.org/downloads/raspbian/. Click on the “Download ZIP” link below Raspbian Jessie as this is the latest version. Double click on the downloaded Raspbian ZIP file and extract the contents. You will now need to download a piece of software called Win32 Disk Imager from http://sourceforge.net/projects/win32diskimager/. Click on the green download link. Insert the micro SD card into an SD adapter and insert the adapter into your computer’s SD card reader. If your computer doesn’t have an SD card reader you will need an external one as mentioned previously. Click on the downloaded Win32 Disk Imager file which will be located in your downloads folder. Click “Next” to select the default install location. (You can of course change the installation path if you wish to). Click “Next” to allow Win32 Disk Imager to create a start menu folder. Leave the “Create a desktop icon” box ticked and press “Next”. Finally click the “Install” button to start the installation. When the installation has completed untick the “View README.txt” checkbox but leave the “Launch Win32DiskImager” ticked. Hopefully now the above screen should have appeared. If it doesn’t show up click on the icon on the desktop for Win32 Disk Imager. To create the SD card press the folder icon and navigate to the downloads folder. 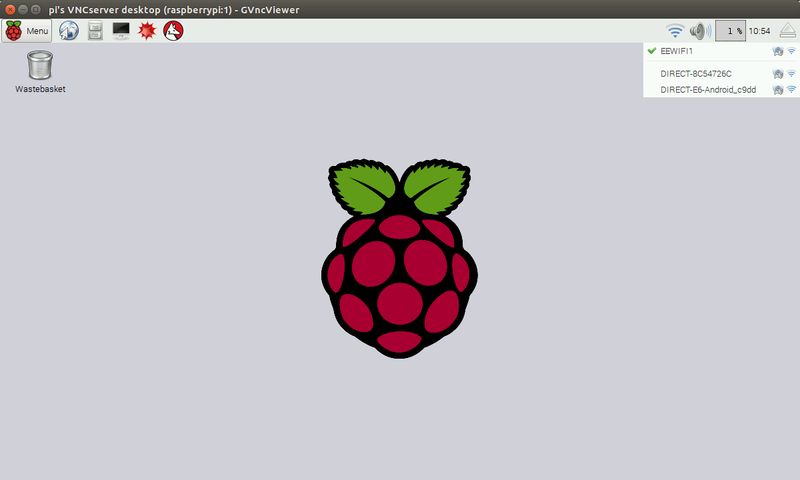 Click on the Raspbian image that you extracted earlier. Change the device dropdown so that it points to the drive letter that matches the SD card. When it has finished click “Exit”. To create the Raspbian SD Card using Linux insert the Micro SD card into an SD card adapter and insert that into your computer’s SD Card reader (either internal or external). These commands cannot necessarily be typed verbatim. You might need to adjust them. The first line changes your current working directory to be the Downloads folder under your home folder. If your downloaded zip file is in a different location then you need to cd to the relevant location. The zip file is correct at the moment but for future releases the date will of course change and it might not be called raspbian jessie anymore therefore you need to replace the unzip command with the correct zip file name. The final line writes the raspbian image to the SD card. There are many things that might need to change on this line. For instance not all distributions use sudo. If sudo is not installed on your computer you will need to use an account with the appropriate permissions to run the dd command and with permissions to write to an SD card. The .img file name may also be different and so you might need to amend this in the future. (This is the bit after if=). The of= section chooses the output location for the image to be written. If your SD card isn’t located in /dev/mmcblk0 then you need to amend it to be the correct location. The above image is a side view of the Raspberry PI zero. The first port from the left is a mini HDMI port. 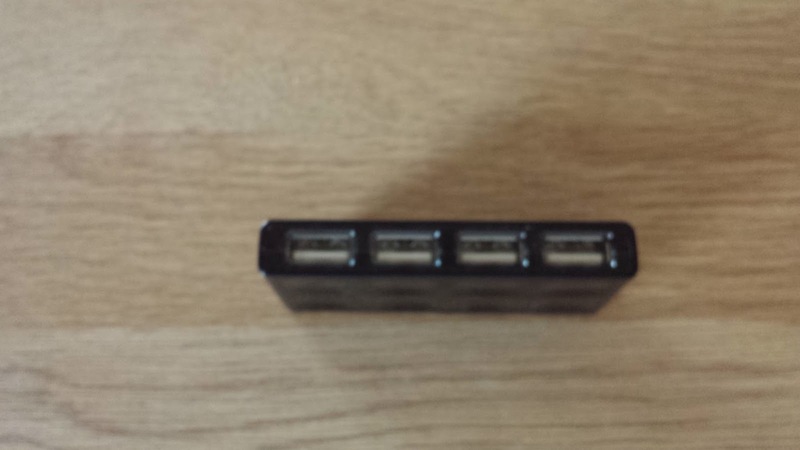 The two sockets on the right are micro USB ports. The first thing you need to do is take the micro USB to USB converter as shown in the image above and insert it into the micro USB socket closest to the mini HDMI port as shown in the image below. 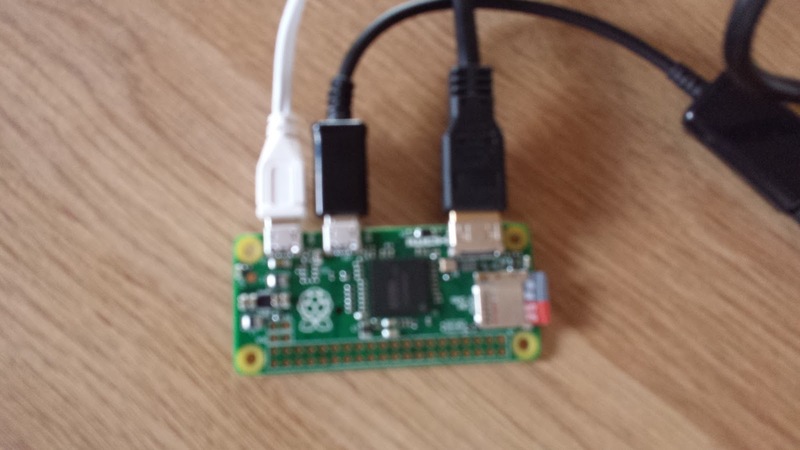 The micro USB to USB converter is very useful as now you can connect your Raspberry PI Zero easily to a 4 port USB hub. 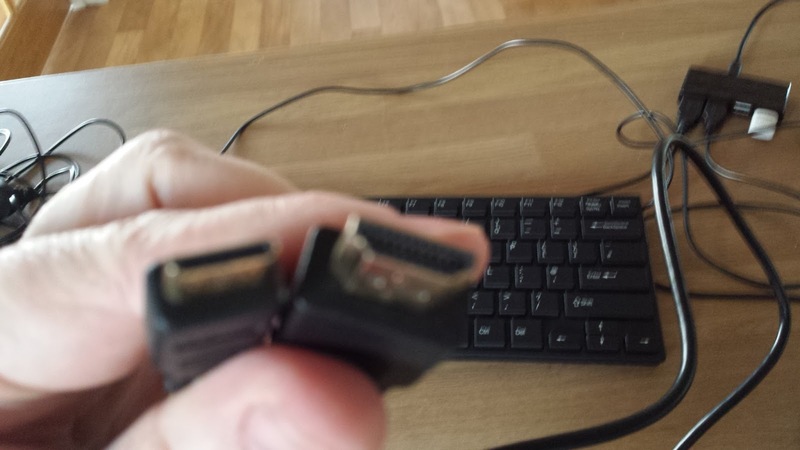 A 4 port USB hub is required for attaching a keyboard, mouse and wireless dongle (ok, so maybe a 3 port hub would suffice but they are less commonly available). 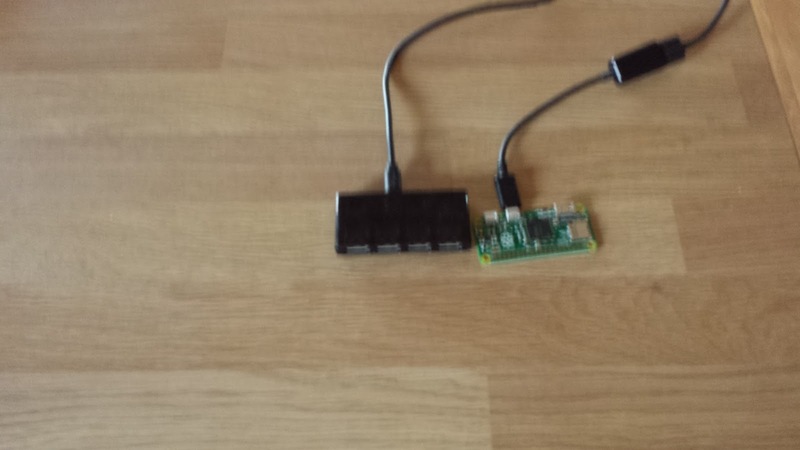 The images above connect a micro USB cable from the hub to the Raspberry PI Zero via the micro USB converter. Now insert the keyboard, mouse and wireless dongle into the 4 port hub. If the hub has a power supply attach it to the hub. The above image shows the mini HDMI to HDMI cable. 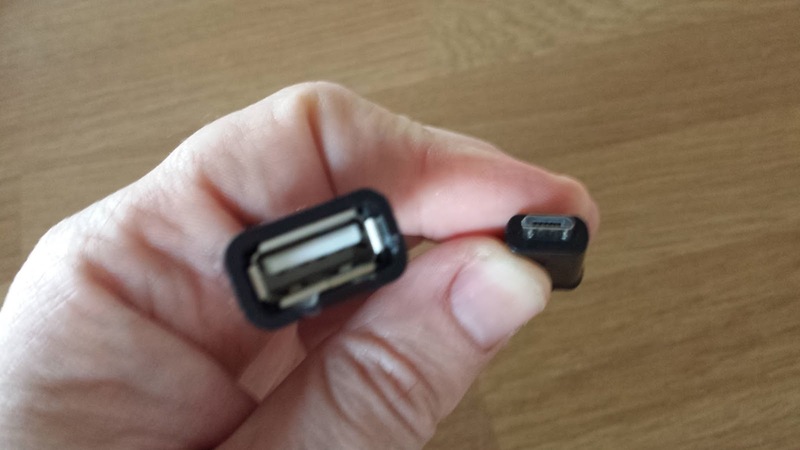 Insert the mini HDMI end of the cable into the mini HDMI port on the Raspberry PI Zero and the HDMI cable into a HDMI socket on a monitor or TV as shown by the image below. 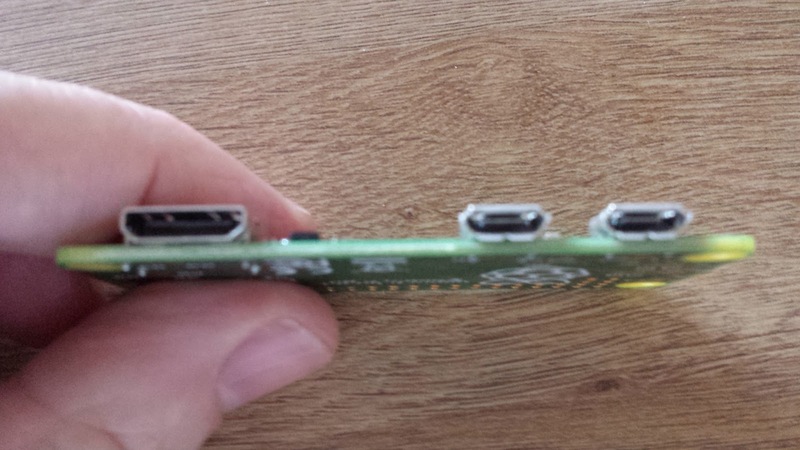 At the HDMI port end of the Raspberry PI Zero is a slot for the micro SD card. Insert it as far as it goes into the slot. Finally insert the Raspberry PI power supply into the remaining micro USB port and plug it into a wall. Flick the power switch and the Raspberry PI should begin to boot and you should see a display on the screen as shown below. First things first, lets start with connecting to the internet. Click on the network icon in the top right corner and choose the appropriate wireless network. Enter the security key when it is requested. (Assuming your network is secure). 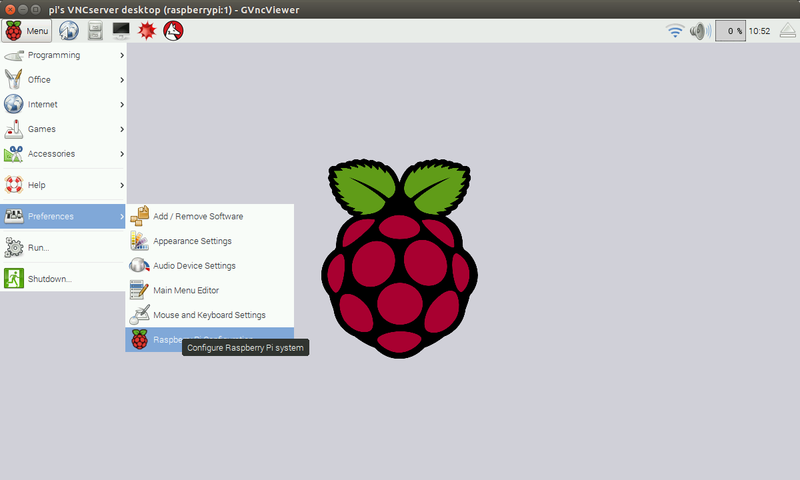 Now open up the Raspberry PI settings screen by clicking the menu icon in the top left corner and selecting “Preferences” and then “Raspbian Configuration”. When the Raspberry PI Configuration screen appears click on the “System” tab (if it is not selected by default) and click the “Expand Filesystem” button. This allocates the entire SD card to the operating system. Click the “Change Password” button and choose a new password. You don’t want to leave it as the default. It is the same as people who leave routers with the admin password set to admin. 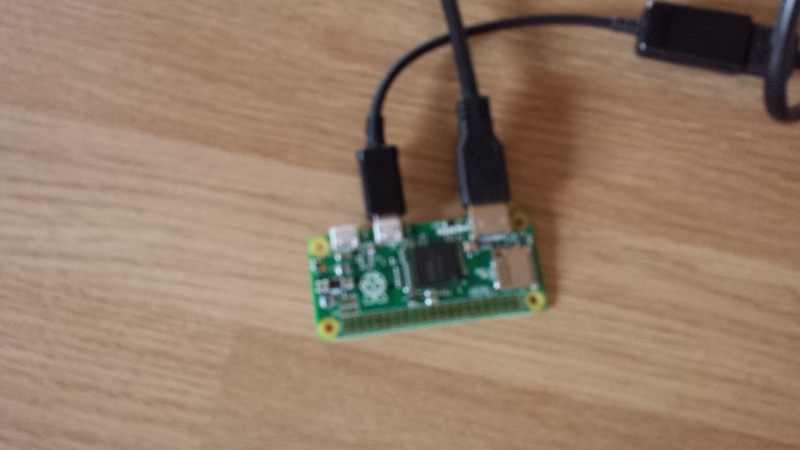 Now that you have set up your Raspberry PI Zero you might decide to use it as a headless server because it is so small and can be plugged in anywhere. 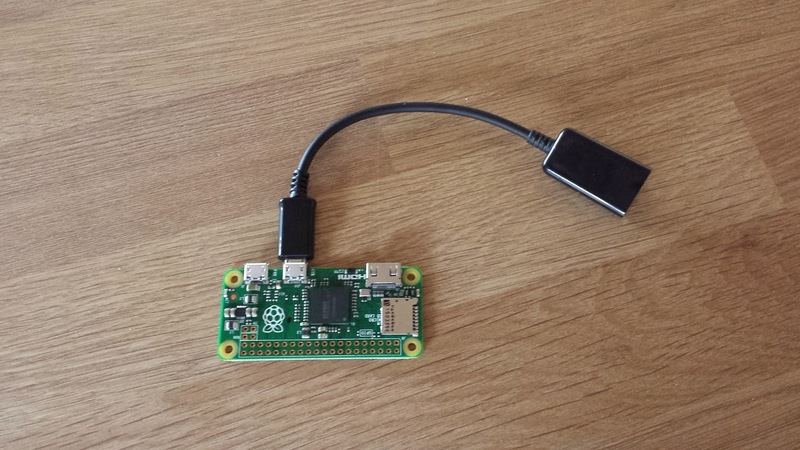 Follow this guide for setting up SSH on the Raspberry PI. In the coming weeks I will be writing more guides dedicated to the Raspberry PI and updating existing guides. Could you have used the USB hub to power it thus only using one plug on the wall? Most likely. I've done it with Beagleboard. Gary is obviously a retarded student. Clone an existing Raspbian image off a working PI and do your simple mods from there. very nice and complete description, congratulations! Where can I put command to start? I will write a guide showing how to do this. Left out Mac users. Almost complete. Do you know if it is possible to run Asterisk on the pi zero ? Can you help me install Asterisk on my Pi zero ? Why is a Linux website instructing me to download a Windows-only app?